In 1987, then-real estate mogul Donald Trump laid out the strategies and wisdom that built him one of America’s largest real estate empires in his book The Art of the Deal. Now, as President of the United States, Donald Trump has been using those same tactics to deliver real results for the American people, and it’s time he gets some credit for his work. The first people in line to thank him should be America’s air travelers, as we’re approaching the one-year anniversary of the Trump administration’s decision to protect America’s Open Skies agreements with some of our key global partners. To provide a little bit of background, the U.S. government negotiates Open Skies agreements with foreign countries to open up the market for air travel worldwide. Before the existence of such agreements, foreign governments pulled the strings when it came to decisions about air service within their borders. How many flights were allowed to enter the country, how many people could be accommodated on board, and how much airline tickets should cost are just some of the important determinations that were out of airlines’ control. Open Skies puts the power back in these airlines’ hands, allowing them to consider demand when operating in new markets, rather than relying on governments to make these decisions for them. By removing the restraints of bureaucracy, Open Skies has done wonders for the American travel and tourism industry. Just ask the State Department, which cites “expanded international passenger and cargo flights to and from the United States, promoting increased travel and trade, enhancing productivity, and spurring high-quality job opportunities and economic growth” as just some of the many benefits we have seen due to Open Skies. It’s no wonder that the United States has signed over 120 of these agreements with a range of different countries. However, another characteristic of Open Skies agreements is that they inject competition into aviation markets, which has been a bitter pill to swallow for some of America’s larger airline carriers. Over the years, these legacy carriers – Delta, United, and American – have challenged Open Skies agreements with Qatar and the United Arab Emirates specifically, pushing the Trump administration to renegotiate our longstanding deals with these countries. Thankfully, under the guidance of President Trump, last year the State Department stood up against their requests and refused to undermine Open Skies, a move that has paid dividends for American citizens from coast to coast. Why is this decision so important? For starters, the very Gulf carriers being targeted by the legacy carriers brought 1.7 million foreign visitors to the United States in 2016. These individuals spent nearly $7.8 billion while inside our borders and supported nearly 80,000 additional U.S. jobs. The economic toll of losing customers like these would be devastating to American enterprise. Open Skies are also essential for the U.S. aviation industry to function at its highest level. As more travelers enter the United States, smaller domestic airlines serving mid-sized cities have been able to expand their routes and offer new connecting flights. This is especially powerful for consumers living outside of major cities like New York and Los Angeles, as they’re given more choice when booking their flights. Plus, while competition may not be the best thing for Delta’s bottom line, it lets the market decide what prices airlines should charge for their tickets. In the case of Open Skies, this has saved passengers an estimated $4 billion. Without President Trump’s leadership, the American public wouldn’t be able to take full advantage of these benefits. So, the next time you’re looking at flights or booking a ticket, it’s President Trump and his administration that deserve the credit for keeping your fares low and choices high. A Republican ally of President Trump is urging the president to enforce an agreement with Qatar aimed at stopping illegal subsidies for its state-owned airline, saying the Middle Eastern nation is cheating on the deal and harming U.S. airline workers. Rep. Matt Gaetz, Florida Republican and a member of the House Armed Services Committee, told Mr. Trump in a letter obtained by The Washington Times that Qatar is “blatantly” violating the Open Skies agreement that is intended to ensure fair competition. The lawmaker said soon after the agreement was reached last year, Qatar Airways purchased an Italian regional airline with $100 million euros from the Qatari government and announced that the new “Air Italy” would fly to five cities in the U.S. In December, a bipartisan group of senators raised similar concerns with the administration. “Not only does Qatar’s cheating undermine competition and threaten American workers — over 1,500 American jobs are lost for every route launched into the U.S. by a subsidized Middle Eastern carrier — but it directly and deliberately threatens our ‘America First’ policies,” the lawmaker wrote. He said the Open Skies agreement was supposed to halt the expansion by Qatar Airways into the U.S. until its state subsidies were halted completely. “Air Italy is nothing more than a proxy airline for Qatar to get around the deal it signed after pledging to stop this trade cheating,” Mr. Gaetz wrote to the president. Negotiations between nation states require a great deal of flexibility and discipline. In the past few days, we’ve seen a variety of international negotiating tactics from the Trump administration. Early last week, we saw strategic restraint. President Trump announced he would delay implementation of an additional $200 billion in tariffs on Chinese products due to progress in trade negotiations with the country. After already following through on the implementation of $250 billion in tariffs last year, which brought China to the table, Trump wanted to send a signal that the United States is a good faith partner. Ultimately, this restraint may allow talks to continue to move smoothly. Then, late last week, we saw a display of strength. The President abruptly cut short his summit with North Korean dictator Kim Jong un because Kim’s demands were unreasonable. Trump needed to remind the North Korean leader that his country is the one that is economically desolate and isolated, and North Korea needs a deal more than the United States. In the coming days, I hope we will see another negotiating tactic from President Trump in his administration’s international dealings: resolve. As I have written before for Fox News, Qatar and the United Arab Emirates have for decades subsidized their state-owned airlines in violation of their Open Skies Agreements with the United States. Open Skies Agreements between countries allow airlines to establish international flights without prior approval from the government. A central tenet of the 126 Open Skies Agreements the United States has with countries that have state-owned carriers is that the flights must reflect actual market demand. This ensures that state-owned carriers do not create international flights that operate at a loss for the purpose of driving other airlines out of business. This ensures a level playing field between privately owned and state-owned airlines. A strong, resolute response to Qatar from our government would show that the United States is no longer going to put up with global cheating in trade. A weak response sends the signal that the Trump administration is not as effective in standing up for American workers as it needs to be. All these countries we are negotiating with will feel emboldened to cheat. Unfortunately, monitoring whether state-owned airlines are living up to this agreement is difficult. For years, Qatar and UAE got away with creating below-market international flights to and from the United States by keeping their finances opaque. But they couldn’t get away with it forever. The Trump administration took a big step in January 2018 by forcing Qatar to agree to transparency in its airlines’ finances. Also, in a side letter to the agreement, the administration got Qatar’s leadership to commit to refrain from adding more flights from third-party countries to the U.S. Unfortunately, Qatar quickly began to find ways to circumvent this agreement. Qatar Airways has a 49 percent stake in Air Italy. However, despite this minority ownership position, the president of Qatar Airways often makes announcements about the future of Air Italy as if he is in charge. This makes sense because Air Italy is depending on Qatar Airways – and thus dependent on the government of Qatar – to stay afloat. Since acquiring the airline in 2017, Qatar Airways has provided cash, airplanes, and other resources. In fact, two years before the announcement, Air Italy operated at a combined 50 million-euro loss. Qatar Airways gave it 100 million euros in cash and guarantees to make up the gap – in addition to aircraft. Over the course of the last year, Air Italy has launched or announced five new flights from Milan to the United States. This is clearly a violation of the agreement Qatar signed with the Trump administration. Qatar is simply using Air Italy to do that which it agreed not to do – launch heavily subsidized service to the U.S. across the Atlantic. It is also typical of the type of maneuvers that different countries – especially ones who subsidize their industries – use to circumvent trade agreements and tariffs. They simply buy an ownership stake in a foreign company not subject to the trade measure and go back to their old practices under a new flag. How the Trump administration responds to Qatar’s truly blatant and obvious cheating is critical. In addition to the negotiations with China, the U.S. recently came to terms with Mexico and Canada on an updated version of the North Atlantic Free Trade Agreement, which is much fairer to the United States. We also reached an agreement with Asian Pacific countries. These new agreements won’t be worth the paper they are written on if the United States will not enforce them. The U.S. should immediately protest Qatar Airways actions to the Qatari government and use full diplomatic pressure to get the government to order their airline to halt the new flights. If the Qatari government does not act quickly, President Trump should be prepared to use the U.S. government’s authority to limit Air Italy’s ability to operate in the United States. By doing so, President Trump would be standing up for the American workers in the airline industry. He would also be putting the U.S. in a more authoritative position to stand up for workers in all American industries against unfair foreign competition. U.S. airlines are facing a pivotal moment as higher fuel prices combine with government policy proposals that threaten to undermine the industry’s profitability after years of struggle. The rising fuel costs are forcing executives to consider raising fares to compensate, a move that may spark consumer backlash, even as Congress debates restrictions to extra fees for services such as checking baggage. Casting a shadow over both is the challenge of navigating divides within the industry and the traveling public over President Trump’s controversial policies, from charging heavy tariffs on imported products to separating parents and children at the southern U.S. border. Several carriers rapidly distanced themselves from the separations, urging the government not to use their services for related activities. “We have no desire to be associated with separating families, or worse, to profit from it,” Forth Worth, Texas-based American Airlines said in a statement. The Department of Homeland Security called the decision unfortunate and lambasted the companies for refusing to protect the traveling public and help the government. The administration’s import duties, meanwhile, won support from Delta Air Lines Chief Executive Officer Ed Bastian, despite opposition from the broader business community and even the typically GOP-friendly U.S. Chamber of Commerce. Bastian’s Atlanta-based carrier is among those working to mitigate the effect of what the International Air Transport Association said was a 51 percent increase in jet-fuel prices, which reached $95.50 per barrel at the start of July. “We have seen early success in addressing the fuel cost increase and offset two-thirds of the impact in the June quarter,” Bastian said in a statement this month. “With strong revenue momentum, an improving cost trajectory” and by trimming less-lucrative seating capacity from the fall schedule, “we have positioned Delta to return to margin expansion by year end,” he said. While the industry has been largely free of price controls since 1978, the fare increases that higher fuel prices are likely to cause raises the risk of government scrutiny as travelers rebel. That would compound the challenge from restrictions on a fee-based price model increasingly popular in the industry in recent years. The rise of low-cost carriers like Southwest Airlines forced larger airlines like Delta and American to begin offering cheaper seats and charging extra fees for upgrading them or checking baggage. Some lawmakers are seeking to insert in a Federal Aviation Administration-funding measure a provision to cap the charges, while the industry says they’re necessary to keep flying affordable for a wide range of passengers. Companies fear that further intrusion from the federal government may nudge the industry closer to the days when all prices were heavily regulated. The Trump administration, which has touted its accomplishments in reducing regulation it deems unnecessary, appears to agree. The Department of Transportation earlier this year urged the Senate to address that provision as it crafts its counterpart bill to the House-passed measure to reauthorize funding for the FAA. “Simply put, this provision marks a return to the pre-1978 era when the federal Civil Aeronautics Board controlled domestic airline fares and other rates charged to the public,” James Owens, the transportation department’s deputy general counsel, wrote in a letter to Senate Commerce Chairman John Thune of South Dakota. Current FAA funding expires at the end of September. Thune and Sen. Bill Nelson of Florida, the top Democrat on the commerce panel, are working to negotiate an agreement to bring the reauthorization bill to the chamber floor, according to Senate Majority Whip John Cornyn of Texas. Despite the challenges, carriers have won some significant victories under the Trump administration. Most notable was a deal the State Department reached with United Arab Emirates to require Gulf carriers to publish annual financial statements. Delta Air Lines, American Airlines and others have long charged that Etihad Airways and others are unfairly subsidized by the UAE. It is important to recognize our country’s victories when they happen. The renegotiation of the Open Skies Agreement with the UAE is great achievement for both our country and the Trump administration. It is one more step in further developing the US economy at home and abroad. For years, the US has faced an issue with a handful of countries not abiding by the agreement. With 125 countries included in the agreement, it is not only unfair to the US but to the other nations who have lived up to their end of the bargain. Offenders have included the Middle Eastern nations of Qatar and the UAE. These trade cheaters have spent upwards of $53 billion in subsidizing their own airlines making for an unlevel playing field and disrupting international air travel. The previous administration tried to many times to negotiate with Qatar and UAE unsuccessfully. The new administration has found better success. In January, the Trump Administration, was able to bring Qatar back to the table to recommit to the agreement and just this past week, the UAE has also agreed to following the guidelines of the agreement. Published on The Cleveland Plain Dealer. From enforcing border security and foreign policy to protecting American jobs, Donald Trump is the “Get-Things-Done” President. Since taking office just sixteen months ago, President Trump has moved at a breakneck pace to enact reforms after reforms that streamline our economy, lower taxes, secure our borders, enforce our trade agreements and reassert America’s strength as the world’s leader advancing liberty. In the waning days of the Obama presidency, careerists at the State Department put American interests and allies in danger with Obama’s ill-conceived Iran Deal. At the time, Americans were told that the agreement would prevent Iran from acquiring nuclear weapons. Assisting with crafting that narrative was White House staffer Ben Rhodes, a self-proclaimed storyteller, whose entire job appears to have been spinning good yarns to accompany reckless foreign policy initiatives. In reality, and as predicted by experienced foreign policy experts like National Security Advisor John Bolton, William Tobey of Harvard University and General William G. Boykin, the Iran Deal wasn’t even a speed-bump in Iran’s development of nuclear weapons. Iran continued its nuclear program unabated, while the United States lifted $150 billion in sanctions, along with delivering a $1.7 billion pallet of cash to the Mullahs. On May 8, 2018, President Trump announced that the United States had officially withdrawn from the Iran Deal, and would instead pursue the reinstatement of sanctions, along with a recommitment to working with our allies to develop a “…a real, comprehensive, and lasting solution…” to the threat of a nuclear Iran. President Trump recognizes that the very same allies we need to block Iran from becoming a nuclear power have been watching the United States to see if we would honor our commitment to Israel. Time and time again, U.S. presidents have promised to move the U.S. embassy from Tel Aviv to Jerusalem. The Israeli people have seen Republican and Democratic presidents come and go, while the embassy remained in Tel Aviv. But all of that has changed with Trump. Just last week, President Trump fulfilled that promise, with the opening of the new U.S. embassy in Jerusalem. The move righted an old wrong, recognizing that Jerusalem is the capital of Israel — something Presidents Bill Clinton, George W. Bush, and Barack Obama had promised to do but failed to execute. Beyond foreign policy, President Trump has enacted an aggressive America First economic agenda at both home and abroad. The end of 2017 saw the passage of a historic tax reform package. Trump became the first president since Ronald Reagan to accomplish such an extensive overhaul of the tax code. Almost immediately, we saw American workers and taxpayers benefiting from the reform through bonuses and increased wages. At the international level, President Trump has put American workers first and sought to seriously enforce our trade agreements. The White House has entered into talks with Canada and Mexico about updating NAFTA for the 21st century and making sure that our neighbors to the north and south are upholding their end of the bargain. Just a few months into 2018, President Trump scored a major win for American airline jobs by resolving two ongoing trade disputes with Qatar and the United Arab Emirates. These two Gulf nations have engaged in illegal subsidization of their national airlines, undermining our Open Skies agreements, and putting American jobs at risk. Writing in that same op-ed, Navarro argues that President Trump’s enforcement of the Open Skies agreements is just another example of Trump’s commitment to keeping his campaign promises. Navarro is absolutely correct. President Trump is keeping his word by putting America first. Isn’t it about time we had a president whose entire agenda puts America — and Americans — first? Published on The Daily Caller. What a week. So much is happening it can be hard to keep current events straight. We’re usually right there with you. But last week, something happened that is cemented into our minds, and it’s such a big deal we couldn’t wait to share it with you. PRESIDENT TRUMP TOOK ACTION TO END THE UAE’S ILLEGAL AVIATION TRADE VIOLATIONS. This is a big win in the fight for fair competition. Don’t get us wrong- there’s more fighting yet to do, and we’ll get to that in a minute, but first, let us break down this historic agreement for American workers. This agreement includes the UAE’s acknowledgment of subsidy harm, a commitment to financial transparency, and a freeze of fifth freedom rights for illegally subsidized UAE carriers. This agreement comes on the heels of a similar one signed with the State of Qatar in January 2018 – back to back trade wins for the President, the American public, and U.S. national security. We are deeply grateful for the President’s leadership on this issue. We’ve made tremendous progress towards leveling the playing field and ending the market distorting subsidies of the Gulf nations. But as we said before, the fight is not yet over. At that same Hudson Institute event, former Secretary of Transportation, Jim Burnley, said, “like Mr. Reagan, Mr. Trump has positioned himself as a strong defender of American workers. For that, he deserves our high praise.” But we must once again, ask our President and his administration to go to bat once again for American workers and ensuring that all the progress that has been made through these agreements is sustained through their enforcement. President Donald Trump and his administration just took important action to keep America safe and to keep our trade fair by striking an important agreement with the United Arab Emirates to end its aviation trade cheating and freeze its plans for future incoming indirect routes (known as 5th Freedom flights) to the United States. As a former Navy SEAL and CIA paramilitary operations officer, I know firsthand how important reliable airlift is to our ability to meet global mission requirements. We cannot stand for any weakening of our readiness, especially by foreign nations who circumvent our trade laws. President Trump’s successful negotiation will ensure that the U.S. military’s ability to deploy troops, strategic assets, and supplies effectively, efficiently and without interruption around the globe will remain unimpeded. This is critical to our national security and President Trump deserves recognition for this important victory for America. Using his skills as a negotiator and a dealmaker, the president and his team brought the UAE — a strategic military ally in the Gulf — to the negotiating table and secured a deal that protects American aviation jobs now and in the future. The UAE and its state-owned airlines, Emirates and Etihad, have been found cheating their aviation trade agreements with the United States by distorting the marketplace with subsidies and seat dumping. This is not only unfair to American workers who must compete against these subsidies; it also puts U.S. national security at risk. President Trump said “no more,” and ensured that a framework was put in place to prevent further harm to America’s economy. The UAE, like Qatar, which President Trump negotiated a deal with this past January, now must abide by international accounting rules. This will ensure that their marketplace distortion will end or they will face severe enforcement penalties. The deal with the UAE, in fact, is stronger than the deal with Qatar, as both parties recognize that subsidies are dishonest, specifically stating, “such government support in whatever form may adversely impact competition in providing international air transportation.” This is an improvement over the deal with the Qatar, because Qatar did not recognize the harm their subsidies cause to international competition and the United States. The UAE proved itself in this negotiation to be truly interested in correcting its mistakes by recognizing the harm it has done and agreeing to meaningful changes going forward. Qatar, however, while agreeing to greater transparency, did not go as far as the UAE and actually accept responsibility that illegal subsidies are harmful to the United States. Further, shortly after the agreement with the Qatar was finalized, one of the subsidies of the state-owned Qatar Airways, an airline it recently purchased in Italy renamed to Air Italy (from Meridiana), announced new service to the United States. This route may be in violation of the agreement freezing any new 5th Freedom flights, and the Trump administration must look into this with great interest and ensure that if it is in violation, that the agreement is enforced and this flight is prohibited. I have a profound appreciation for the role the U.S. civil air transport industry plays in our nation’s military preparedness, supplementing the resources of our Defense Department. When I served the Navy, our Special Operations Forces regularly deployed around the world — to dozens of countries — and we often relied on our nation’s commercial aviation industry for transportation. When the UAE and Qatar were cheating our trade agreements, they were undercutting our civil air transport partners upon whom our military relies. That put U.S. workers at a disadvantage, and put the U.S. companies and workers the military relies on at unacceptable risk. The actions taken by the Trump administration with the UAE and Qatar will help to level the playing field for U.S. workers, and safeguard the readiness of our civil air transport partners when the military needs them. Robert Mitchell is a cybersecurity entrepreneur, former Navy SEAL and former CIA paramilitary operations officer. Yesterday, the United States and the United Arab Emirates (UAE) signed an agreement regarding the future of their Open Skies agreement, a deal that follows on the heels of a similar agreement reached with Qatar a few months back. Open Skies agreements are trade agreements in the form of bilateral treaties that permit cross-border competition in commercial aviation. The United States has over 120 Open Skies agreements, and all but two have been enormous successes. The new agreement with the UAE addressed a substantive problem: UAE subsidies to state-owned airlines that were forcing competitors out of the market. The subsidies are in violation of Open Skies’ Fair Competition clause — in which all airlines are allowed a “fair and equal” opportunity to compete — and forced U.S. airlines to terminate their competing routes to Gulf nations. Without enforcement, UAE-owned airlines would continue benefitting from these subsidies and driving U.S. competitors out of the market. By re-negotiating these Open Skies agreements, the Trump Administration has used its trade-enforcement tools to bring the Open Skies agreements back to their original intent. As Eakinomics noted earlier, this willingness to enforce trade agreements will be an essential part of restoring the public’s faith in negotiating future trade agreements. The UAE agreement is a significant accomplishment. The UAE had resisted attempts to start discussions for three years. The Trump State Department not only got the UAE to the negotiating table, but also achieved several significant steps forward. The UAE acknowledged for the first time the existence of subsidies and the fact that government subsidies undermine healthy market competition. Accordingly, it agreed to conduct all transactions with their airlines at commercial, arms-length prices — no more cushy deals that implicitly are subsidies. To further display its commitment to a level playing field, the UAE agreed to financial transparency — using internationally accepted standards for accounting and financial statements. Thus, outside groups (e.g., the U.S. carriers) will have the ability to monitor the UAE’s compliance with this agreement. That monitoring is an important part of the work going forward. After all, the UAE did not comply with its original Open Skies agreement; nobody should simply assume that they will comply with this one. Finally, the UAE agreed that its airlines should not introduce any new “Fifth Freedom” flights — routes on which U.S. customers can travel to, e.g., Europe without actually setting foot in the UAE. The subsidies had driven U.S. carriers off these routes and cut back on the feeder flights from domestic places to cities with international flights. Competition will be improved across both the domestic and international networks. The agreement is important for commercial aviation in the United States. But it may be just as important as a model for successfully enforcing trade agreements more broadly. Published on American Action Forum. In what appears to be a divergence from the terms of the US and United Arab Emirates (UAE) new Open Skies side agreement, a top White House official told industry stakeholders that there is a freeze on adding routes to the US. Peter Navarro, assistant to US President Donald Trump and director of the White House Trade Council, told aviation industry stakeholders during a briefing May 14 that the UAE had committed to a freeze on fifth freedom routes to the US as part of their agreement to continue the two governments’ Open Skies pact, signed in 2002. “There will be no additional routes into the United States until further notice,” Navarro said. “That’s a promise that will be kept.” But he added the freeze applied only to passenger airlines, not cargo carriers. FedEx operates fifth freedom rights via Dubai, while Dubai-based Emirates Airline operates two fifth freedom routes, from Italy and Greece, to the US. Abu Dhabi-based Etihad Airways does not operate any such routes. Navarro’s statements, however, do not sync with UAE government statements, which say the Open Skies agreement remains fully intact. Nor do they fit with the side document recording main points agreed—known as the Record of Discussion—which makes no mention of route freezes or fifth freedom restrictions. Washington DC-based lobbying organization, the Partnership for Fair & Open Skies, which was hired by those US airlines that wanted to restrict the ability of the major Gulf carriers to expand their US networks, issued a release touting Navarro’s statements as proof that the UAE airlines’ routes have been frozen. The White House did not respond to an ATW request for clarification on the governments’ differing interpretations. The US and UAE governments announced the agreement May 14, with the UAE posting the Record of Discussion. Much of the document is a diplomatic affirmation of the importance of the two government’s economic and security ties and an acknowledgement of the mutual benefits of Open Skies. Campaigns over three years by American Airlines, Delta Air Lines, and United Airlines, supported by unions such as the Air Line Pilots Association, International (ALPA) and Association of Flight Attendants (AFA), are believed to have cost them some $50 million as they lobbied to prove that Emirates Airline, Etihad Airways and Qatar Airways were heavily subsidized by their governments and therefore were contravening the Open Skies agreements with the UAE and Qatar. The US allegations were not proven, but led to government talks that resulted in the Open Skies side agreements with both the UAE and Qatar. An agreement was reached with the Qatar government in January. WASHINGTON (Reuters) – The United States and United Arab Emirates signed a deal on Friday to resolve U.S. claims that Gulf carriers have received unfair government subsidies, sources briefed on the matter said. The voluntary agreement, which applies to Etihad and Emirates airline and is expected to be announced next week, is similar to a deal announced in January between the United States and Qatar in which Qatar agreed to release detailed financial information about state-owned Qatar Airways. Since 2015 the largest U.S. carriers have urged the U.S. government to challenge the conduct of the three major Middle Eastern carriers under “Open Skies” agreements. The U.S. airlines contend the Gulf carriers are being unfairly subsidized by their governments with more than $50 billion in subsidies over the last decade. Breitbart News reported how several foreign nations – including the UAE – have been subsidizing their nation’s state-owned airlines to the tune of $52 billion, in violation of “Open Skies” executive agreements that those nations have with the United States. For the UAE, the two carriers are Emirates Airlines and Etihad Airways. Those “Open Skies” trade agreements are designed to ensure free market competition between airlines, without government support. The Trump administration acted on the issue after Breitbart News and other outlets brought the issue to light, with the State Department and Transportation Department pushing through an agreement that will protect U.S. workers and bolster America’s economy. Sources close to the deal speaking exclusively with Breitbart News on condition of anonymity say that the United State and UAE are signing an agreement in private on Friday that will be announced on Monday, ending these subsidies and restoring a competitive environment for U.S.-based carriers. Freeze any new “fifth freedom” flight routes, under which UAE companies could fly routes directly between the United States and other foreign countries, harming the ability of United, American Airlines, and Delta to compete in those same routes. Reporting any new transactions involving Emirates Air and Etihad. Requiring Emirates Air and Etihad to fully pay for new airport construction and development, which previously had been subsidized by the UAE government. Operating in a transparent manner according to international accounting standards, ensuring compliance with the terms of this agreement. Meet with U.S. representatives in one year to review the results of implementing the new agreement. Any violations of this deal could result in the United States invoking Article 15 of the agreement, under which America could disallow any flights by UAE-owed airlines in the United States, with devastating consequences to those foreign airlines. Experts estimate that the Trump administration’s new trade deal could protect as many as 1.2 million jobs which depend on a robust domestic airline industry. This deal comes on the heels of the Trump administration’s success in January of getting Qatar to sign such an agreement. Unconfirmed reports are that Secretary of State Mike Pompeo will make the announcement on Monday regarding the UAE alongside the foreign minister from that nation during his visit to Washington. Supporters of United, American Airlines, and Delta had tried for the final two years of Barack Obama to persuade his administration to do something about this issue. One year after President Trump took office, a new agreement has been reached, consistent with the president’s America First agenda. News broke today that as a result of President Trump’s leadership on trade enforcement to safeguard U.S. jobs, the United Arab Emirates (UAE) has agreed to end its market distorting airline subsidies and freeze any additional new 5th Freedom routes into the United States. This is a huge step forward in the fight for fair competition in the international aviation marketplace. Americans for Fair Skies, and the tens of thousands of aviation workers and hundreds of thousands of Americans who have spoken up in support of our effort, sends its sincere appreciation to President Trump and his Administration for taking meaningful action to end the aviation subsidies by the UAE, and its two state-owned airlines, Emirates Airline and Etihad Airways. President Trump’s leadership and deal-making savvy has now led to successful negotiations for U.S. workers with both the UAE and State of Qatar, which was announced this past January, the two biggest trade cheaters in aviation history. President Trump’s agreements with the UAE and Qatar will ensure that U.S. aviation companies and their workers, consumers, communities, and our country will remain competitive and safe from unfair trade practices. The recognition that subsidies in aviation are wrong and the increased transparency agreed upon by the UAE will allow the U.S. government to ensure that Emirates and Etihad (and Qatar Airways from the previously announced agreement) all operate free from state subsidization and quickly address the issue if any of the carriers continues to cheat. Like the agreement with Qatar, the UAE agreement also forces the UAE airlines to cover their own airport expenses instead of letting its government pick up the tab. Most significantly, the Trump Administration successfully received assurances from the UAE and Qatari governments that their will not operate any new 5th Freedom flights into the United States. This is huge, especially for the UAE, as Emirates had been planning a massive, job-killing expansion into the United States, which is now frozen. The Gulf carriers, Emirates, Qatar Airways, and Etihad Airways, have received over $50 billion dollars in illegal subsidies from the governments of Qatar and the United Arab Emirates. These illegal subsidies have cost over 1,500 American jobs for each discontinued or forgone international flight, hurting U.S. companies and their workers. The subsidies have hurt America’s consumers and connectivity by reducing the number of flight options and destinations, impacting over 8,000 consumers each day. This will now halt, as President Trump has put American workers first, and put a framework in place to end the subsidies from the UAE and Qatar. 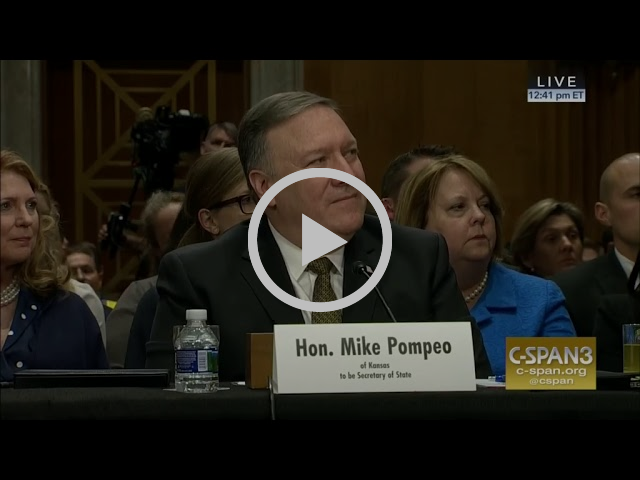 Yesterday, Senator Johnny Isakson – a longtime supporter of Fair Skies – took part in Secretary of State-designate, and current CIA Director, Mike Pompeo’s confirmation hearing. In addition to discussing State Department morale, Senator Isakson asked for Director Pompeo’s commitment to enforce America’s crucial Open Skies Agreements, which have been long-abused by two nations, Qatar and the UAE, which are cheating American workers. Thankfully, Mr. Pompeo offered a clear promise to continue the enforcement of these agreements. Director Pompeo’s commitment to Open Skies enforcement is a welcome development. The State Department under Secretary Tillerson took an important first step forward when they successfully negotiated a deal with Qatar that resulted in increased transparency commitments from Qatar Airways and an important written pledge not to fly 5th Freedom routes into the United States. However, the fight is far from over, and American aviation workers need a Secretary of State who will lead the charge against unfair, anti-competitive, and job-killing Gulf aviation trade subsidies. This includes holding Qatar accountable to the agreement it signed and ensuring action is taken to force the United Arab Emirates – which has two subsidized airlines flying into the U.S. – to comply with its Open Skies agreement. Quickly confirming Director Pompeo as Secretary of State is in the best interest of US consumers and workers, the American aviation industry, and the economy. Americans for Fair Skies calls on the Senate to efficiently conduct the confirmation process so that Director Pompeo can begin the urgent work of helping advance President Trump’s international agenda and stand up for American workers threatened by Gulf cheating. With increasing global instability, our nation’s ability to respond and adapt to evolving scenarios is more critical than ever. The ability to effectively and efficiently meet our regional Combatant Commander’s requirements to deploy troops and supplies without interruption is fundamental component of our nation’s national security, military readiness, and ability to project both humanitarian assistance and power. A unique and significant part of our nation’s air mobility resources, especially when rapidly deploying troops and supplies, is the Department of Defense’s partnership with U.S. commercial airlines through the Civil Reserve Air Fleet program, better known as CRAF. U.S. civil air carriers contract with the CRAF program to provide select aircraft for the deployment of personnel and resources when emergency airlift requirements exceed the capability of military aircraft. These carriers volunteer their aircraft to the CRAF program, which today is comprised of more than 450 aircraft that are ready for deployment less than 48 hours after they are called into service. Participating U.S. commercial airlines maintain a minimum commitment of 30 percent of their CRAF capable passenger fleet and 15 percent of their CRAF capable cargo fleet in support of CRAF related activity. These planes are maintained by the airline and flown by airline employees when called into service. From the Berlin Airlift to Operation Desert Shield and Operation Iraqi Freedom, U.S. commercial airlines have deployed their airplanes and resources on CRAF missions for decades. The CRAF program represents a remarkable public-private partnership that has helped to advance American values, protect American national security interests, and support American aid and military efforts across the globe. However, this crucial partnership is threatened by subsidies undermining U.S. aviation transport trade agreements with the United Arab Emirates and State of Qatar. These subsidies are not only an exploitation of American trade policy that threatens an industry vital to the American economy, but present a threat to U.S. national security and military readiness. These subsidies are being used to finance rapid global expansion by the state-owned airlines of Qatar and the UAE with the aim of driving competitors, including U.S. airlines, out of international markets and off global long-haul routes. It is these routes requiring long haul aircraft that allow for the support of our military readiness through the CRAF program. We cannot allow unfair trade practices by foreign governments to weaken our military readiness. We must keep America safe and our trade fair. The negative impact of these foreign carrier subsidies and their impact on our national security is compounded with the reality that approximately 1,500 aviation jobs are lost for every route ceded or surrendered due to this subsidized competition. These lost jobs represent not only the aircrew that fly these aircraft in times of crisis with CRAF, but also the maintenance workers and technicians, and the ramp supervisors and dispatchers who ensure safe global operations. Sir, you have stated that free and fair reciprocal trade is priority for your Administration, as is ensuring our national security and military readiness. Our Department of State’s recent announcement that the State of Qatar has agreed to match American levels of financial transparency demonstrates your personal commitment to these priorities. You brought Qatar to the table and reached a deal that, if adhered to, would put an end to Qatar’s trade cheating and level the playing field for American air carriers and their workers. This would ensure the American companies can compete in the international marketplace fairly, and therefore protects the integrity of the CRAF program. By enforcing our trade agreements, you are working to reestablish America’s economic power and to improve our military readiness. The agreement with Qatar is an important first step in the right direction, but the full implications of this development will be more fully realized once the U.S. takes action in regard to the stateowned and state-subsidized airlines of the United Arab Emirates, which continue to be less transparent and exhibit the same unfair trade practices. We must complete the mission. The UAE has two massive state-subsidized airlines that, like Qatar Airways, undercut U.S. airlines in the international marketplace and threaten our military readiness. Mr. President, by leveraging the initial success with Qatar to bring about a negotiated deal during the ongoing talks with UAE, you can ensure that we continue to keep America safe and to keep our trade fair. Tell President Trump that would you like him keep America safe and our trade fair by signing our petition. On the heels of the successful passage of President Trump’s tax reform that lowers taxes for tens of millions of America’s working families, the president is making the surprising move of pushing for a tax increase in the form of tariffs. The president is proposing a 25 percent tariff on steel imports and a 10 percent tariff on aluminum imports – which may very well protect the 140,000 or so American jobs in those industries, but will also simultaneously damage up to 5 million American jobs that depend on steel and aluminum imports. Myopic protectionist schemes rarely help the overall workforce, and they almost always create price hikes for U.S. consumers. Where tariffs are concerned, the economic costs far outweigh any potential benefit. President Trump’s instinct here to protect American jobs is unassailable. But his proposed method of implementing protectionist tariffs will (if history is any guide here) backfire and lead to economic disruptions in U.S. manufacturing. However, as long as the president has started the much-needed conversation about trade deals and protecting American workers, how about an agenda item that would enforce trade agreements in the United States’ favor and protect American workers? The Open Skies trade agreements provide exactly that opportunity. The enforcement of our Open Skies agreements with the United Arab Emirates would accomplish everything President Trump is seeking to do with the steel tariff proposal, but without the negatives that necessarily result from protectionism. President Trump has already scored a major victory in this area this year, and should be applauded for the steps he has taken to enforce our Open Skies agreements with other countries. The Open Skies agreements, which are bilateral trade agreements, govern international air travel and stipulate the conditions for fair and free trade in international air travel. The agreements specifically forbid governments from significantly subsidizing airlines because of the market distortions that result from government interference.Two of the most flagrant abusers of that particular provision of the Open Skies agreements have been Qatar and the United Arab Emirates, which have both pumped billions of dollars (upwards of $52 billion since 2004, in fact) into their state-owned airlines in an elaborate scheme to undercut international competition. In the short term, this type of government-orchestrated market interference tilts the playing field in favor of the grossly subsidized airlines, making it difficult for other international airlines to fly certain routes. In the long term, however, the consequences are much more serious. U.S. airlines, unable to compete with oil-rich governments’ subsidized airlines, will be forced out of major international routes and could even be forced out of business. The good news is that the Trump administration has been listening to Americans’ opposition to these violations of the Open Skies agreements. And, even more importantly, the Trump administration has taken swift action to enforce the Open Skies agreement. Back in January, the Trump administration landed a big victory during the U.S.-Qatar Strategic Dialogue, when Qatar agreed to provide detailed and transparent financial records. Those financial records will enable the State Department and other U.S. agencies to evaluate possible violations of the Open Skies agreements. Moving forward, the Trump administration should insist that the United Arab Emirates submit to the same transparency standards that Qatar recently agreed to implement. That would mean, at a minimum, the full release of its financial records, in accordance with internationally recognized accounting standards. Fully 10 million U.S. jobs and $1.5 trillion in nationwide economic activity depend on our nation’s airline industry. The enforcement of all of the Open Skies agreements provides a platform for President Trump to protect American workers and consumers, all while creating new economic opportunities. Ensuring that other nations abide by the both the spirit and the letter of the agreements is critically important for protecting those millions of American jobs. President Trump’s success in January is the model his administration should replicate in its negotiations with the United Arab Emirates. On the campaign trail, Donald Trump frequently promised to protect the U.S. economy by putting American workers first in policy-making decisions. His campaign message was refreshing for American workers who, all too often, are often overlooked in Washington, D.C.
By enforcing the Open Skies agreements, President Trump is putting into action his America-first campaign promise. Orignally Posted on the Washington Times. The United States military is the most powerful fighting force the world has ever seen. During my decades of service as a Navy SEAL and later as a CIA Paramilitary Operations Officer, the strength, intelligence, and determination of our service members was always on display. Whether on the front lines or stationed at a base overseas, our men and women in uniform routinely made tremendous sacrifices to protect and defend both our homeland and our allies. However, American air carriers have been undermined for years by illegal and anti-competitive trade practices by the State of Qatar and the United Arab Emirates. Their systematic efforts to circumvent and defy existing fair trade practices threaten the crucial role that a healthy aviation industry plays in our national security. Any interference with military readiness puts the lives of American service members at risk, and we must demand that foreign powers are not allowed to do so with impunity. After years of inaction from the Obama administration, President Trump finally initiated a mission to stand up both for our troops and for American aviation workers by holding Qatar and the UAE accountable for their behavior. After forcing Qatar to come to the table, he successfully negotiated an agreement that will provide greater transparency to Qatar Airways’ business transactions and stop them from establishing any potential “fifth-freedom” routes. This agreement goes a long way to protect American workers and stop foreign interference in our military readiness. I thank the President for his effort and his success. President Trump’s leadership on this crucial issue has been in keeping with his commitment to promote fair trade and strengthen national security, but more work remains to be done. I have a request for the President: complete the mission. The United Arab Emirates continues to inject massive subsidies into its two international airlines, Emirates and Etihad Airways. In fact, Emirates recently used that subsidy to purchase 16 billion dollars’ worth of Airbus A380s. They will use these aircraft to continue artificially expanding capacity and distorting aviation markets around the world. By flying these massive planes on routes that do not necessitate the additional capacity and pricing the seats at unprofitably low rates, carriers that play by the rules, like U.S. airlines, will be forced to abandon once-profitable routes. This flagrant abuse of our trade agreements costs American jobs, and if they are allowed to continue these illegal and anti-competitive trade practices, U.S. military preparedness will continue to be threatened. This is not acceptable. Although both the United Arab Emirates and Qatar are vital allies in the Middle East, allies can have disagreements. When conflicts arise between friends, it is crucial to resolving them quickly and equitably in the interest of stability. Right now, the UAE and Qatar are embroiled in a diplomatic dispute, and the UAE is unlikely to follow Qatar’s lead and negotiate in good faith with the United States of their own accord. Therefore, action must be taken soon to bring them to the table. Thankfully, President Trump has already shown that he is the man for the job. President Trump, your action against Qatar was an important first step in keeping America safe and our trade fair. But until the UAE comes to the table and takes significant steps to end the harm they have caused to the American aviation industry and its workers, and to U.S. military readiness, the mission is not yet complete. Robert Mitchell is a cybersecurity entrepreneur, former Navy SEAL and CIA Paramilitary Operations Officer. With increasing global instability, our nation’s ability to respond and adapt to evolving scenarios is more critical than ever. The ability to effectively and efficiently meet our regional combatant commander’s requirements to deploy troops and supplies without interruption is a fundamental component of our nation’s national security, military readiness, and ability to project both humanitarian assistance and power. A unique and significant part of our nation’s air mobility resources, especially when rapidly deploying troops and supplies, is the Department of Defense’s partnership with U.S. commercial airlines through the Civil Reserve Air Fleet program (CRAF). U.S. civil air carriers contract with the CRAF program to provide select aircraft for the deployment of personnel and resources when emergency airlift requirements exceed the capability of military aircraft. These carriers volunteer their aircraft to the CRAF program, which today comprises more than 450 aircraft that are ready for deployment less than 48 hours after they are called into service. Participating U.S. commercial airlines maintain a minimum commitment of 30 percent of their CRAF-capable passenger fleet and 15 percent of their CRAF-capable cargo fleet in support of CRAF-related activity. These planes are maintained by the airline and flown by airline employees when called into service. As a naval aviator and commercial airline pilot, I have developed a profound appreciation for the important role that the U.S. civil air transport industry plays in our nation’s military preparedness. From the Berlin Airlift to Operation Desert Shield and Operation Iraqi Freedom, U.S. commercial airlines have deployed their airplanes and resources on CRAF missions for decades. The CRAF program represents a remarkable public-private partnership that has helped to advance American values, protect American national security interests, and support American aid and military efforts across the globe. However, this crucial partnership is threatened by subsidies undermining U.S. aviation transport trade agreements with the United Arab Emirates (UAE) and State of Qatar. These subsidies are not only an exploitation of American trade policy that threatens an industry vital to the American economy, but they present a threat to U.S. national security and military readiness as well. These subsidies are being used to finance rapid global expansion by the state-owned airlines of Qatar and the UAE with the aim of driving competitors, including U.S. airlines, out of international markets and off global long-haul routes. It is these routes requiring long haul aircraft that allow for the support of our military readiness through the CRAF program. We cannot allow unfair trade practices by foreign governments to weaken our military readiness. The negative impact of these foreign carrier subsidies and their impact on our national security is compounded with the reality that approximately 1,500 aviation jobs are lost for every route ceded or surrendered due to this subsidized competition. These lost jobs represent not only the aircrew that fly these aircraft in times of crisis with CRAF, but also the maintenance workers and technicians, plus the ramp supervisors and dispatchers who ensure safe global operations. President Donald Trump has clearly stated that free and fair reciprocal trade is an administration priority, as is ensuring our national security and military readiness. Our Department of State’s recent announcement that the State of Qatar has agreed to match American levels of financial transparency demonstrates the Trump Administration’s commitment to these priorities. By enforcing our trade agreements, Trump is working to re-establish America’s economic power and improve our military readiness. The president and his team brought Qatar to the table and reached a deal that, if adhered to, would put an end to Qatar’s trade cheating and level the playing field for American air carriers and their workers. This would ensure the American companies can fairly compete in the international marketplace, and therefore protects the integrity of the CRAF program. By enforcing our trade agreements, Trump is working to re-establish America’s economic power and improve our military readiness. The agreement with Qatar is an important first step in the right direction, but the full implications of this development will be more fully realized once the U.S. takes action in regard to the state-owned and state-subsidized airlines of the UAE, which continues to be less transparent and exhibit the same unfair trade practices. The UAE has two massive state-subsidized airlines that, like Qatar Airways, undercut U.S. airlines in the international marketplace and threaten our military readiness. The recent success of negotiations with Qatar will hopefully influence ongoing discussions with UAE to ensure that Trump can keep America safe and to keep our global trade fair. Vice Adm. John G. Cotton is a 35-year Navy veteran and last served as chief of Navy Reserve and commander of the Navy Reserve Force in the Pentagon. He is currently a defense and security consultant and a senior fellow at the Joint Forces Staff College. A top Delta Air Lines executive says the U.S. airline industry is seeing gains in its effort to restrict the U.S. growth of three subsidized Middle East carriers, thanks largely to President Trump’s administration. Two weeks ago, the Qatari government agreed to annually provide audited financial information for Qatar Airways, a step that could lead to diminished state subsidies. Qatar also said the carrier has no current plans to begin “Fifth Freedom” flights between third countries and the U.S.
U.S. government negotiators have moved on to talks with the government of the United Arab Emirates, seeking similar goals in what would appear to be a tougher setting. Dubai-based Emirates airline already serves New York from Athens and Milan, while Abu Dhabi-based Etihad Airways, struggling financially, depends heavily on subsidies. “I would hope our government has the same kind of relationship with the UAE that it has with Qatar [and] and can do a deal that would require government-owned airlines to operate without benefit of a subsidy,” Carter said. In the case of Emirates, Carter said, U.S. airlines do not envision halting the two fifth freedom flights serving Athens and Milan. As for Etihad, “I am not sure whether or not the nation of the UAE can justify two carriers of that size and scope,” Carter said. “It looks like Etihad has really existed solely as a result of the largesse of the UAE. Whether it could retool without those subsidies and try to only fly routes that have appropriate demand, I don’t know. “When European airlines said no to state aid, a number flourished and a number had to shut down.” he said. Carter spoke in behalf of the Partnership for Open & Fair Skies, a coalition that includes American, Delta, United and seven major airline labor unions and that lobbies for the U.S. to enforce Open Skies agreements with UAE and Qatar. On Thursday, the partnership is scheduled to release a letter calling for an end to the Open Skies violation and signed by governors from 10 states, including four – Georgia, Michigan, Minnesota and Utah – that have Delta hubs. The letter, sent to Secretary of State Rex Tillerson and Secretary of Transportation Elaine Chao, notes that the Emirates, Etihad and Qatar have received more than $50 billion in government subsidies, in violation of the Open Skies agreements. The U.S. airline industry offers 19 daily departures to China, but only two daily United departures to India, a similarly sized country, partially because the Middle East carriers have built sizable market shares between the U.S. and India. For its part, rather than compete with subsidized carriers, Delta ended Amsterdam-Mumbai service in March 2015 and Atlanta-Dubai service in February 2016, eliminating hundreds of employment opportunities in each case. Amsterdam is a hub for Delta joint venture partner KLM. The Obama administration “did acknowledge that the subsidies were real, but for whatever reason, they were moving very slowly,” perhaps because the administration “was winding down and it is harder to get things done at the end of an administration,” he said. The Trump administration’s recently announced agreement with the State of Qatar promises marketplace protections for the 1.2 million American jobs that depend on a strong and stable U.S. aviation industry and indicates that the White House is serious about enforcing its Open Skies agreements. “The Trump administration has demonstrated its commitment to enforcing our trade agreements and protecting American jobs from unfair competition through its recent agreement with Qatar,” James H. Burnley IV, one of the nation’s foremost authorities on transportation law and policy, told Transportation Today. The agreement, announced Jan. 30 during a U.S. State Department event featuring Secretary of State Rex Tillerson and Secretary of Defense James Mattis as part of the U.S.-Qatar Strategic Dialogue, is “a set of understandings on civil aviation” aimed at ensuring healthy competition exists in the global aviation sector while maintaining the U.S. Open Skies framework, according to the State Department. Since 1992, the United States has entered bilateral Open Skies trade agreements with 121 countries to foster airline industry growth and enable passengers to fly from the United States to almost anywhere around the globe, explained Burnley, who is chairman of the Eno Center for Transportation and a partner at the Washington, D.C., law offices of Venable LLP. “The bilateral treaties were put in place to create an open marketplace where airlines could freely and fairly compete for travelers’ business on their products’ merits, free of market distortions,” wrote Burnley, who served as the U.S. Secretary of Transportation from 1987 to 1989, the Deputy Secretary of Transportation during 1983-1987, and as general counsel of the department in 1983, in a recent article for the Eno Center. But two of the 121 agreements — which get negotiated by the State Department and the U.S. Department of Transportation — haven’t been working as intended, namely those with the United Arab Emirates (UAE) and Qatar. The Partnership for Open & Fair Skies has documented more than $25 billion in subsidies that the government of Qatar has provided to its state-owned airline in violation of its Open Skies agreement with the United States. The partnership said it has been working with the U.S. government for almost three years to address the more than $50 billion in rule-breaking subsidies it says the Gulf carriers – the state-owned airlines Emirates, Etihad Airways and Qatar Airways – have received since 2004 from the UAE and Qatar. Such government subsidies create an uneven playing field that U.S. carriers cannot fairly compete on, according to the airlines and industry stakeholders, and they threaten U.S. jobs supported by the aviation industry. If left unchecked, the Gulf carriers will continue to expand into the United States, putting at risk service to small and medium-sized communities around the country, stakeholders say. “Fair and free trade is a cornerstone of our great country and essential to ensuring American economic strength and growth,” wrote Burnley, who is also a consultant for American Airlines, a member of the Partnership for Open & Fair Skies. In fact, for every international route where a U.S. carrier cannot compete and is forced to cede the route to a subsidized Gulf carrier, over 1,500 American jobs are lost, according to the partnership, a coalition that along with American Airlines also includes Delta Air Lines and United Airlines, the Air Line Pilots Association, the Allied Pilots Association, the Southwest Airlines Pilots’ Association, the Association of Professional Flight Attendants, the Association of Flight Attendants-CWA, the Communications Workers of America, and the Airline Division of the International Brotherhood of Teamsters. As part of the recent agreement between the U.S. and Qatar, the partnership said Qatar has committed to operate in a transparent manner by using internationally agreed upon accounting and auditing standards and applying commercial terms to all transactions. Martin also thinks the U.S.-Qatar agreement will benefit American workers, who have seen “their slipping importance and relevance in Washington as politicians have routinely prioritized Silicon Valley, Wall Street and other crony capitalist interests” over them, she wrote. And in general, the agreement with Qatar is a win for free market supporters who think “winners and losers in the market should be determined through fair competition — not through heavy-handed government programs or massive government subsidies,” Martin wrote. Additionally, under the U.S.-Qatar agreement, Qatar has promised not to introduce any “fifth freedom” passenger flights to the United States, which are flights coming from outside Doha carrying passengers to the United States, according to the Partnership for Open & Fair Skies. Now the focus turns to enforcement of the U.S. Open Skies agreement with the UAE. Moving forward, the Partnership for Open & Fair Skies said it intends to work with the Trump administration to ensure Qatar upholds its commitments. The coalition also said it looks forward to working with the Trump administration as it negotiates with the UAE to end its government subsidies to Emirates and Etihad Airways. The slogan “Make America Great Again” was always much more than a catchy phrase for bumper stickers; it was the unifying theme that knit together all of Trump’s policy objectives. And, while making America great again benefits all Americans, there was one primary demographic group with whom the message especially resonated – American workers. American workers have witnessed their slipping importance and relevance in Washington as politicians have routinely prioritized Silicon Valley, Wall Street and other crony capitalist interests over the needs of America’s working families. But all of that is changing with Mr. Trump in the White House. Just last week, the president again demonstrated his commitment to America’s workers – this time with the announcement that the White House is requiring Qatar to live up to the terms of the Open Skies agreement. During the U.S.-Qatar Strategic Dialogue in January, the Trump administration announced that Qatar has agreed to disclose its financials in a more detailed and transparent way than it has previously. Why does this matter? For years, the government of Qatar funneled billions of dollars in the form of subsidies to Qatar Airways in direct violation of the Open Skies agreement with the United States. The Open Skies agreement with Qatar – a bilateral trade deal allowing travel between the two countries – stipulated that neither government could distort the marketplace by providing mass subsidies. But that is exactly what Qatar did for more than a decade, pumping a shocking $25 billion into its state-owned airline. Qatar has not been alone in its flagrant violation of the Open Skies agreement. The United Arab Emirates has also thumbed its nose at the agreements, choosing to subsidize its two state-owned airlines, Emirates and Etihad Airways. The effects of this type of government subsidizing are catastrophic. In the short-term, these governments’ interference in the marketplace undercuts U.S. airlines and forces our airlines to compete not with other airlines, but with oil-rich governments – an unequal playing field, if ever there were one. In the long-run, this type of tampering with the marketplace would drive U.S. airlines out of business. American workers were right to be concerned about these violations of the trade agreements, which directly threaten the 1.2 million U.S. jobs that rely on a healthy aviation industry. Qatar and the UAE have both engaged in dishonest accounting methods to distort and conceal the truth about the extent to which the governments have kept the three state-owned airlines afloat. Thanks to President Trump’s persistence, Qatar is now committing for the first time to provide more transparency in its record-keeping. The Trump administration’s win with Qatar is a win for everyone who supports the free market and believes winners and losers in the market should be determined through fair competition – not through heavy-handed government programs or massive government subsidies. The Trump administration’s agreement with Qatar means that one of the most heavily subsidized airline carriers in the world, Qatar Airways, will be forced to play by the rules – a welcome change, indeed. Perhaps the best part of the new agreement with Qatar is the ripple effect it is likely to have with other countries – most notably the UAE. As Secretary of State Rex Tillerson said in announcing the agreement with Qatar: “The president has made this matter a priority, and the outcome we achieved will ensure a level playing field in the global aviation market.” The UAE should view this announcement as a new era in treaty enforcement – one in which the United States takes seriously trade violations that disrupt the market and unfairly disadvantage U.S. workers. Previous administrations, especially the Obama administration, treated U.S. workers as mere afterthoughts in policy-making. It is encouraging that the Trump administration has put American workers’ needs front and center in policy decisions. Americans should take note of how Mr. Trump’s Make America Great Again agenda has already transformed U.S. policy-making. And, for that matter, the United Arab Emirates might want to pay attention to that, too. The US military’s ability to deploy troops, strategic assets, and supplies effectively, efficiently, and without interruption around the globe is critical to our national security. Military readiness and the projection of power abroad are key pillars of our nation’s strength. As a former Navy SEAL and CIA paramilitary operations officer, I know firsthand how important reliable airlift is to our ability to meet global mission requirements. We cannot stand for any weakening of our readiness, especially by foreign nations who circumvent our trade laws. During his recent State of the Union address, President Trump stated: “From now on, we expect trading relationships to be fair and very importantly to be reciprocal.” Trump and his administration took action to keep America safe and to keep our trade fair. Using his skills as a negotiator and a dealmaker, the president and his team brought the nation of Qatar, a strategic military ally in the Gulf, to the negotiating table and secured a deal that protects American aviation jobs now and in the future. Qatar and its state-owned airline have been accused of cheating their aviation trade agreements with the United States by distorting the marketplace with subsidies and seat dumping. This is not only unfair to American workers who must compete against these subsidies; it also puts U.S. national security at risk. President Trump said “no more,” and ensured that a framework was put in place to prevent further harm to America’s economy. Qatar now must abide by international accounting rules, and will no longer fly indirect routes (known as 5th Freedoms flights) to the United States. This will ensure that their marketplace distortion will end or they will face penalties and is critical not only to safeguarding U.S. jobs, but also for ensuring our military is prepared to meet challenges around the globe. When I served the Navy, our Special Operations Forces regularly deployed around the world — to dozens of countries — and we often relied on our nation’s commercial aviation industry for transportation. I therefore have a profound appreciation for the role the U.S. civil air transport industry plays in our nation’s military preparedness, supplementing the resources of our Defense Department. When Qatar was cheating our trade agreement, they were undercutting our civil air transport partners upon whom our military relies. That put U.S. workers at a disadvantage and put the U.S. companies and workers the military relies on at unacceptable risk. The actions taken by the Trump Administration this week will help to level the playing field for U.S. workers, and safeguard the readiness of our civil air transport partners when the military needs them. As President Trump said on Tuesday evening: “America has also finally turned the page on decades of unfair trade deals that sacrificed our prosperity and shipped away our companies, our jobs and our nation’s wealth.” President Trump is a man of strong words, followed up with robust action. His work this week to keep America safe and to keep our trade fair is proof of that.